If you haven’t done so yet, do check out the online comic When I Am King from Demian.5. It’s really interesting how he uses the Web to tell his story in a non-traditional way. Do take the time to go through all the chapters, as things really evolve (in the way he uses the medium) in the later chapters. There’s an interesting profile of the author at the Shift magazine. For another great example of the types of comics that are really taking advantage of the Web, check out the Pay Your Reality Tax site. Escaperail is a site that presents pictures of fire escapes. Really nice photography. Really great stuff, most of which I had never seen. And for the stuff that I had already seen, it was definitely nice to get to see them projected on a big screen with great sound. a journey that starts from an overcast morning at lax terminal 2 goes right across america from west to east and south to north, from los angeles to new york, from virginia to vancouver. a limousine is rigged with digital micro-cameras and electronic devices to record gibson’s impressions as he travels. the entire film consists of material generated by this four-wheeled media machine. a documentary on william gibson’s life and work by the man himself. The Stilling Project by Nei and Lena has some nice photography, presented in a simple yet attractive slide-show format. DELVE is a nice online zine with a nice mix of photography and design. I like the way the magazine is presented, which makes it feel like a print zine. 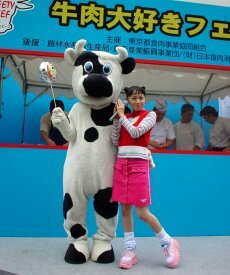 Campaign girl Vanilla Yamazaki, 24, takes part in a beef promotion by the Tokyo Meat Industry Co-Operative Association in Shinjuku to improve the industry’s image in the wake of the mad cow disease and mislabeling scandals. Free steak was given to pedestrians. Even in Japan, almost everything on TV right now is something about the 9/11 remembrance. Earlier tonight there was a live show with Takeshi Kitano in New York as host. It was very strange seeing him being serious on Japanese TV, as we’re used to seeing him being a complete clown all the time. And speaking of Kitano, I finally saw HANABI (FIREWORKS) recently. Another great Kitano film. 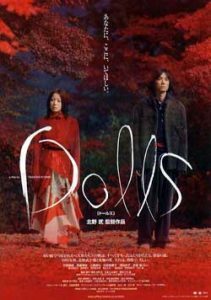 I am really looking forward to seeing his new film, DOLLS, which just recently premiered at the Venice Film Festival. It’s a bit of a departure from his usual directorial projects as he doesn’t appear in it. You can get more info on the film, as well as a beautiful Flash intro, at the official site. I’m watching a late-night Japanese animation on TV right now (started at 2am) called RAH-XEPHON. I think it just started, but man, talk about fucked-up. It’s kind of like walking into a David Lynch film during the strange bits. The presentation is very cool, all dark colors, and letter-boxed. It takes place in a sort of future, and there seems to be angel-type figures fighting, and then it jumps to someone who thinks he’s dead, or maybe not. Lots of talk about gods. There’s confusion as to what world/dimension all the characters are in. Very strange indeed. It sort of feels like the last 2 episodes of EVANGELION. The soundtrack for the show is really nice, mostly piano, and great at creating the proper mood.